Good morning my crafty people! I have a super-awesome, simply wonderful, amazing announcement! 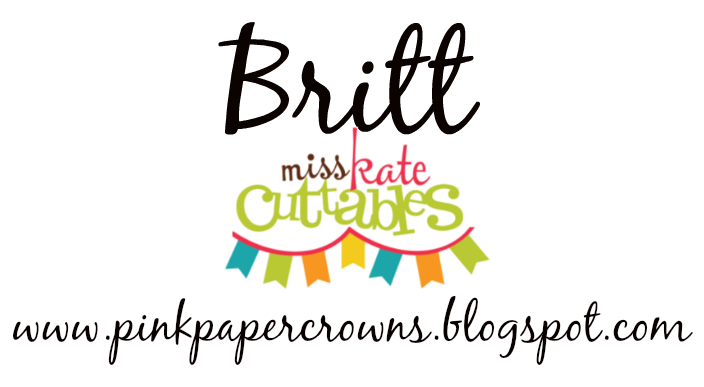 I am pleased to tell you that I am a member of the very first Miss Kate Cuttables Design Team! All of us on the team have made some pretty cute projects to celebrate the announcement - so, let's get to the sharing! I used the Miss Kate file called Garden Gnome for my card. Isn't he the cutest!? You can find him and lots of other adorable files HERE. "To celebrate our New Blog and Design Team we are giving away a Silhouette Cameo to one lucky follower! Plus Miss Kate has put together a collection of her favorite Cuttable Files to be given out to everyone who follows our contest rules and designers blogs so make sure you go over to the Miss Kate Cuttables Blog for details and Contest Rules"
So, want to win that Cameo? How about the freebie bundle? Visit Miss Kate Cuttables website HERE for all the rest of the details and to enter the contest! There will also be plenty more inspiration on the other DT members' blogs - so don't forget to check them all out, follow them and tell them how cute their projects are! Congrats Britt!! Can't wait see al your amazing projects!! Congratulations on making the Miss Kate Cuttables DT! Your little Gnome Card is adorable and I can't wait to see your upcoming projects. I'm a follower! Congrats! I am a new follower. Hope you will stop by when you get a chance. CUTE!!! Love that gnome. Congrats on your DT! Happy New Year and Congratulations on becoming a new DT member of Miss Kate Cuttables!! Oh so cute card!! Congrats and Happy New Year. I am a new follower and are looking forward to lots of inspiration in 2014. Congratulations and I love this card. Such a cute idea. I love the cute card with the little gnome! Congrats on being chosen for the design team! I am a new follower! Congrats! Such a cute card! Love the file! I LOVE Miss Kate Cuttables! Hi Britt, I am a new follower from Miss Kate Cuttables. Congrats on becoming a design team member. This gnome card is so cute, I love that mushroom paper too. they go well together. So cute! And what perfect paper to go with your darling little gnome!! Love the grass too! Congratulations! 2014 will be an exciting year for Miss Kate. She has GREAT designers! I am a follower. Great card! Congratulations. New follower and so excited to see what DT will bring to Miss Kate Cuttables. congrats on your news, excited to see all the fun projects during 2014! Congrats, Britt, on becoming a new member of the MKC Design Team! I am now a new follower of your blog through Bloglovin! Your card today is adorable ... love the sentiment! Looking forward to seeing more of your creativity! Happy New Year! congratulations..I am following you, anxious to see what you create with this awesome team! Congrats to you!! This is ADORABLE and FUN!! Looking forward to seeing your projects! TFS! This card is adorable!! congratulations! congrats! looks like you have fun stuff. just started following can't wait to see more. Such a cute card!! 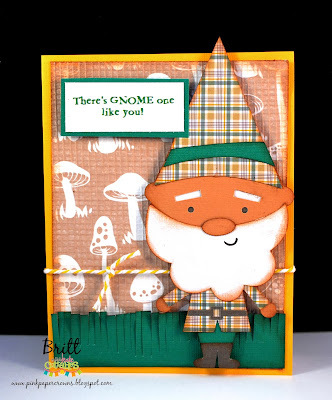 Love the plaid paper you used on the gnome!! Too cute! Looking forward to working with you! Happy New Year!! I LOVE your little gnome Britt!! Happy New Year ~ super excited to be a part of the new Miss Kate Cuttables Design Team with you. Congrats Britt. I'm a new follower. What an AMAZING line up for a DT! Can't wait to see what you all create in 2014. I got a Cameo for Christmas so needless to say, I'll be stopping by a lot! Very cute card! Congrats on the new design team. I am a new follower and look forward to more of your projects. Congrats to you my dear how awesome!!!! Love your card is so sweet. Also wow a chance to win a Cameo wow!! How sweet of Miss Kate. Looking forward to a creative 2014. Congrats and can't wait to see all you awesome projects! I am a follower! Great job Britt. I love how your GNOME turned out. Im a new follower. Congratulations!! I am a new follower looking forward to seeing more of your work. Cute gnome!! So excited to be a new follower of your blog. Congrats on being selected to be on Miss Kate's design team. Love you gnome card and can't wait to see other creations you make using her SVG files. Excited to be a new follower of your blog. Congrats on being on Miss Kate's Design Team. Love your gnome card and look forward to see what other projects you create using her SVG files. Congrats on your DT placement!!. I am following, and look forward to awesome inspiration!! Congrats on the design team! I am a new follower and love your gnome! Happy New Year & congrats on becoming a Miss Kate's DT member. What an adorable card and oh your Gnome is so adorably cute. Congrats! Love your gnome project. I just bought gnome cookie cutters.....hmm, great idea to pair with your card for friends at school! I am following. Congrats on making MKC DT! So cute. Congrats on being chosen for the design team and will be looking forward to seeing more. Congratulations on making the Design Team Britt! Your gnome is darling and such a great card for many occasions! Already a Blog follower! Congrats, super cute card, love that gnome!! Adorable gnome card! I'm a new follower! Congrats on being on the Design Team! I am a new follower. Cute card. Very cute. So excited about the new blog. I'm now a follower. Super cute!!! I'm now a follower. I have been a follower. Congrats on the DT! Your project is so fun! He is so cute.. love it!!! Congratulations on DT! How fun!! I love your little card. It's so cute. :) I am so happy I get to find some new blogs through this HOP and for a chance to win such awesome prizes. I'm so excited to be following and to see what you'll be doing and creating in 2014!! Happy New year!!! P.S. I also wanted to say I LOVE your hair!!! Congratulations! Very cute garden gnome. Congrats on being on the MKC DT. I'm following you now. Have fun now. Congratulations! I am a new follower. Britt, congrats on your new DT assignment! Your gnome is adorable. Thanks for sharing. I am a new follower. Cute gnome, cute card! New follower. Love the Gnome and congrats to you!!! Such cute projects. Love them all. So cute!!! New follower. Love MKC files. Thanks. Congrats! New follower and cute project! Super cute gnome! Love how you used him. Your card made me smile. CUTE! Congratulations on your DT post! Cute little DT post! Congratulations on your DT position. Love the adorable gnome. I'm a follower. Adorable love the little gnome.. Great job and congrats on the DT. Congratulations! Sweet card! I am a new follower and look forward to seeing what you create! Congrats on being on the DT. Looking forward to seeing each of your new creations. Happy New Year. The gnome is so cute, love him. Congrats to you on the DT. I am a new follower, looking forward to 2014. Congratulations on becoming a DT member for Miss Kate's! I can't wait to see everything else you all have in store for us. I'm a follower! Cute card, happy to follow your blog, congrats on becoming a DT member for MKC! Congratulations on your new post as DT! Your little garden nome is adorable!! Didn't see my comment, think I did a boo boo, lol. Adorable card, happy to be a follower and congrats on becoming a DT member for MKC! Congratulations on making the Design Team! Love your Gnome card! I'm a happy new follower of your blog! Congrats! This is an awesome bunch of girls! I am a new follower and I can't wait to see what you all do. Your gnome is sooo cute!! Cute card. I like gnomes. New subscriber. Hope to see some good stuff in the future. Congrats on DT. Congrats & Happy New Year! LOVE your cute little gnome card! I am a new follower and can't wait to see what you create! Congrats! Love the gnome!!! I am a new follower and am looking forward to seeing what you and the rest of the wonderful design team do. Can't wait for all the MKC inspiration that awaits us!!!!! Super project...congrats on getting selected for the DT. I am a new follower. Congrats...loved the cute card....M ur new follower. Adorable little gnome! I'm now a follower!!! I love that gnome! He IS adorable! New follower and I love all your projects! Congrats on the DT!! Congrats on making the DT. I am a new follower! Can't wait to see what you come up with. Congrats! I'm a new follower. Your gnome card is adorable, I love the mushroom paper! Congratulations on the new design team. I'll be a new follower. SWEET, SWEET, SWEET! Now I know why you were chosen for the DT! CONGRATS!! Love your darling little card! Congratulations on being a DT member, how exciting! Happy to be a new follower too! Congrats and I love your gnome. I'm a new follower. very sweet looking gnome card..congrads..im new to this..and also cute holiday items. New follower here! Cute project!! Can't wait to see more! Congratulations on making the DT!!!! Hi Britt, I am a new follower. This is such a cute card, I love it!! Congratulations on your new DT position with Miss Kate, I am so glad she directed me to your page. Happy New Year to you. Love your card, I'm a new follower. Congratulations on making the design team and I can't wait to see what else you create. Congrats on MKC DT!! Very cute!! Such a cute gnome! I can't wait to see what fun projects you create in the future! Congrats on the design team! I'm your newest follower! Congrats!! I love that gnome, he is so stinkin cute!! Very cute! I'm a new follower! Congratulations on making the design team!!! :) I love your cute gnome card! Congrats on the DT!!!! Your card is so adorable!!! I love that Gnome!!! I'm a follower!!! Congrats on making the DT! What a cute card -- the mushroom background paper is perfect for it. I'm a new email follower -- that way I won't miss any of your posts. So cute! Count me a follower. Wonderful project! Just became a follower! Love your card! Congrats! I'm a follower! Thanks for a chance to win! Congratulations! I am a new follower to your blog. Very cute!